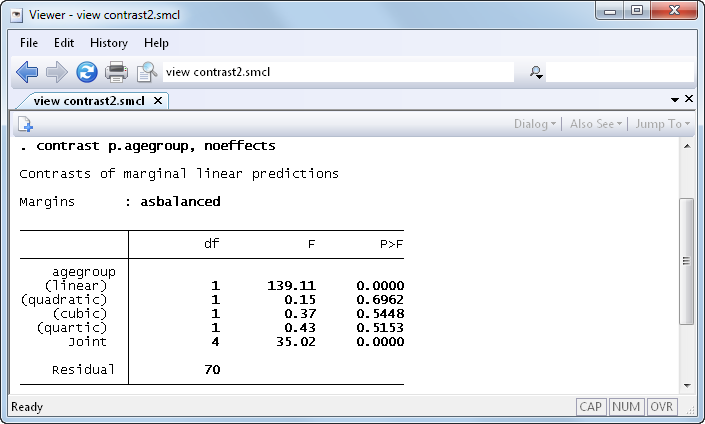 Contrasts were introduced in Stata 12. See the latest version of contrasts. 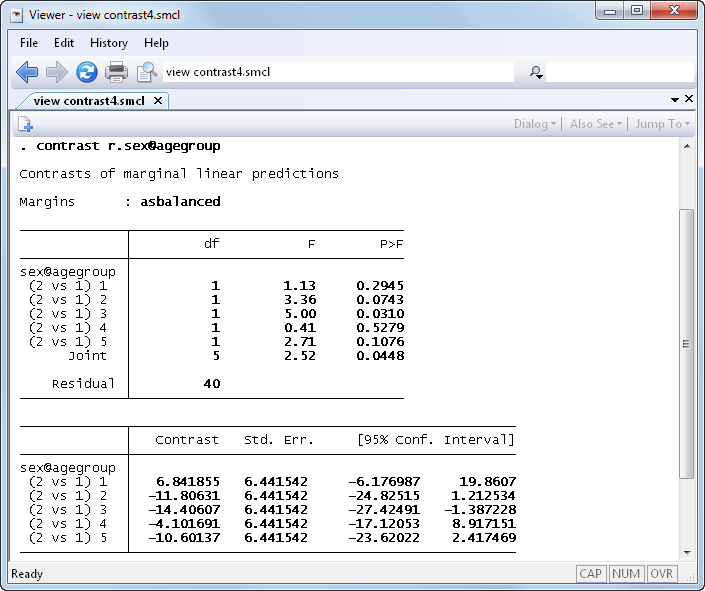 See all of Stata's contrasts features. 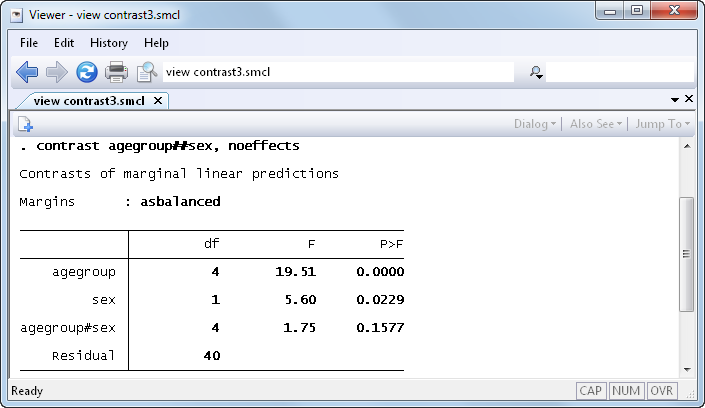 Stata can now perform contrasts involving categorical variables and their interactions after almost any estimation command. The new contrast command provides a set of contrast operators that make it easy to specify named contrasts such as reference-level contrasts, adjacent contrasts, Helmert contrasts, and orthogonal polynomial contrasts. You can also specify your own custom contrasts. contrast can perform joint tests of these contrasts and can produce ANOVA-style tests of main effects, interaction effects, simple effects, and nested effects. we could use reverse adjacent contrasts, which are specified with the ar. operator, to test whether any age group could be combined with the previous age group. We could test whether there is a linear, quadratic, cubic, or even quartic trend using orthogonal polynomial contrasts, which are specified with the p. operator. we can test for main effects and interaction effects. In this case, we could have obtained these tests from anova. However, contrast can perform tests of main and interaction effects after other types of models. We can test for a difference in the estimated cell means for men and women within each age group. 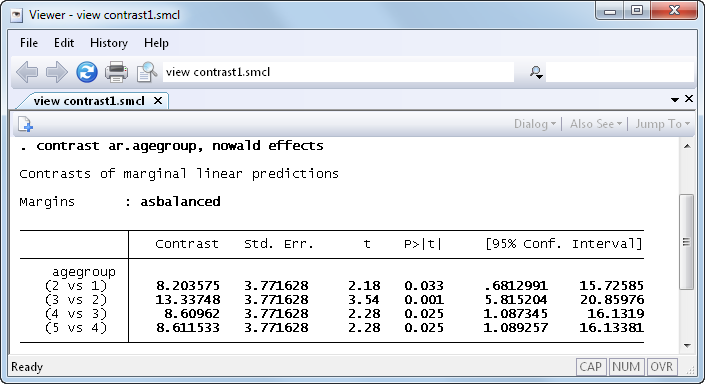 The margins command now works with contrast operators as well so that we can obtain contrasts of any margins that can be specified with this command, such as contrasts of the marginal predicted probabilities after logistic regression.